Set in the heart of the Cotsworlds, England, The Lakes by YOO is a private estate of second homes and rental residences developed by design company, YOO. Amongst the other lakeside properties, this unique estate is home to a very special residence: the Barnhouse, a five bedroom country home that was Kate Moss’ first foray into the world of interior design. Recently, DesignCurial were offered the opportunity to see the Barnhouse first hand, and to find out more about YOO – including their newest collaboration with luxury property and travel club, THIRDHOME. A luxury property and travel club founded by Wade Shealy, THIRDHOME offers its members the chance to explore the world by trading time in their second homes for stays in spectacular destinations. Called the 'YOOClub', the new THIRDHOME x YOO collaboration has created a way for owners of YOO properties to get more value from their residence; the YOOClub gives them access to other YOO properties, including the Barnhouse at The Lakes by YOO, as well as access to THIRDHOME’s portfolio of high-end second homes around the world. Co-founded by property entrepreneur John Hitchcox and designer Phillipe Stark, YOO is a unique residential and hotel design company that draws on the creative visions of world renowned designers – including Jade Jagger and Kelly Hoppen - for its projects. Interestingly, Moss was brought on-board to create the interiors for the Barnhouse by Hitchcox, who she became friends with through their “love of the English countryside”. Finished with a pitched roof and a Cotswold stone cladding, the Barnhouse is set on one acre of private woodland – within The Lakes’ 650 acre estate. Supported by Katie Grove of Grove Interiors, Moss’ polished interiors include earthy undertones, such as the “Stone” and “Moon Grey” walls; the ground floor features pale wooden floors, whilst upstairs is lined with a thick, grey carpet. House plants are dotted throughout the space, and the large windows fill the property with an abundance of natural light. In the main hallway, statement lighting fixtures shine onto a double-height wall of original artwork, which Moss has taken great care to curate – pieces include art by Damien Hirst and Chris Levine. Though she was inspired by old country homes, the former supermodel has created an eclectic range of interiors for her first home design; throughout the Barnhouse there are mixtures of industrial, mid-century and pop-art designs, with many of the pieces paying homage to the 1920s, 60s or 70s. In the open plan kitchen, Moss has created an intense, sophisticated atmosphere using indigo blue cabinets and dark slate countertops. A large island sits in the middle of the kitchen, made from solid concrete. The space leads through to the living area, where a dining table divides the room neatly in half. The table was created bespoke for the Barnhouse, by West Country based craftsman David Haddock – who also designed the table’s matching velvet-topped benches. In the living area, art-deco meets industrial design through the use of a modern, sleek fireplace, a statement chandelier and an abundance of brass furnishings. Two curved, deep button velvet Talisman sofas fill the space, one a forest green and the other golden yellow. The living room also features an awe-inspiring double-height gable window; it fills the room with natural light and looks out onto the greenery of the surrounding woodland. Guests can also access the Barnhouse’s private outdoor pool, lounging deck, or the large well-kept garden from the living area. Adjacent to the swimming pool is the second lounge, which features two floor-to-ceiling windows that look out over the garden. In contrast to the main living area, the second lounge is reminiscent of pop-art and mid-century modern design; a light wooden desk sits in the corner, while the vibrant velvet pink sofa contrasts against a shockingly blue TV cabinet. Overhead, a statement glass chandelier feels like it has been taken straight from 1950s Italy. Each of the Barnhouse’s seven bathrooms - two downstairs and five en-suites - has been finished with beautiful tiling work, each boasting individual colours and patterns. The bedrooms have also been individually styled to appeal to families. 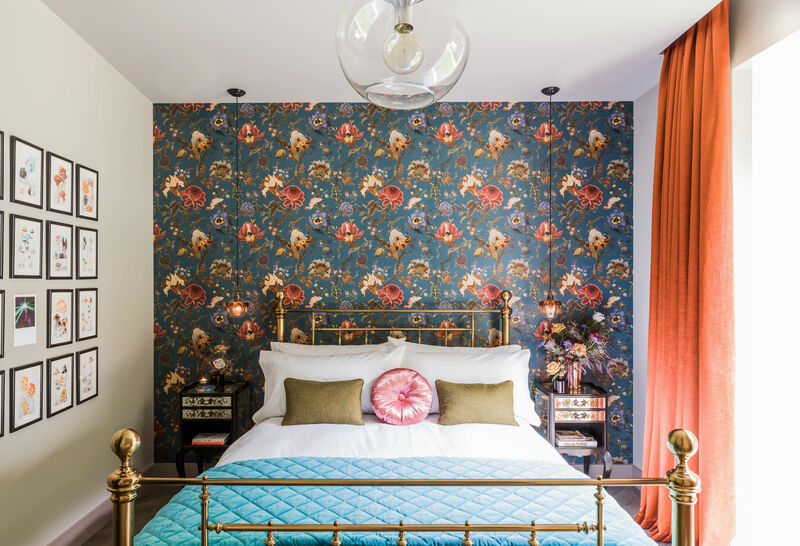 Two of the bedrooms have been designed with a nod to traditional English heritage - behind the beds, statement walls are covered in vibrant floral wallpaper; artworks of flowers appear on walls, and throws and pillows are earthy toned. 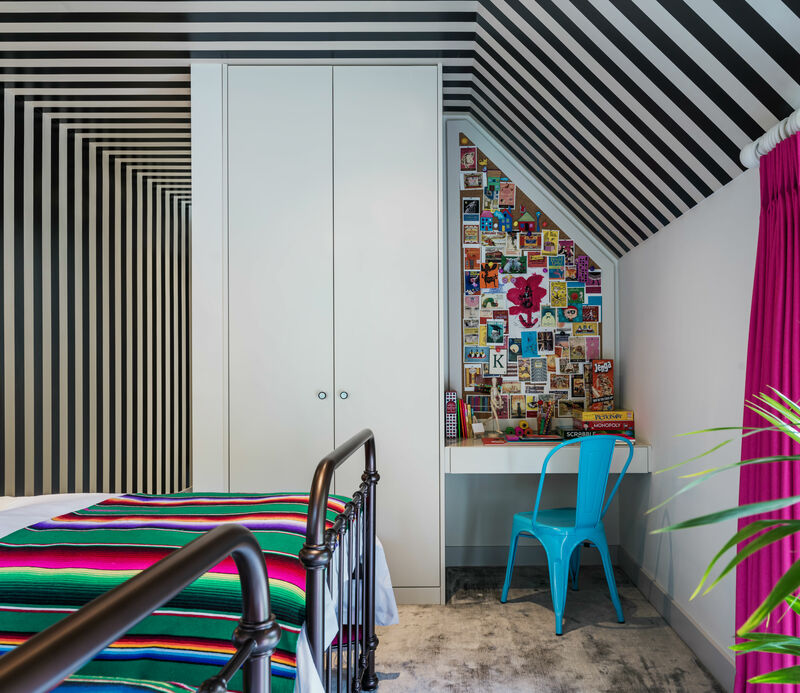 Upstairs in the twin bedroom – perhaps designed with children in mind – pop-art influences shout through loudest; the room has bold pink curtains and striped black-and-white wallpaper. Other bedrooms have been designed with a modern vintage appeal, including the master bedroom; it features a lavish, art deco four-poster ‘emperor’ bed with mirrored columns – another bespoke furnishing created by David Haddock. The master bedroom also looks over the double-height living area, with floor-to-ceiling windows making up one wall and giving guests a unique view of the property. For her first interior design project, Moss has created a bold, sophisticated range of looks for this exceptional five bedroom home. Those wishing to visit the Barnhouse should be aware that - as it is one of the first properties to be included in the THIRDHOME x YOO partnership, the 'YOOclub' - this beautifully designed property will be in high demand. Alternatively, the Barnhouse can be rented directly through The Lakes by YOO. 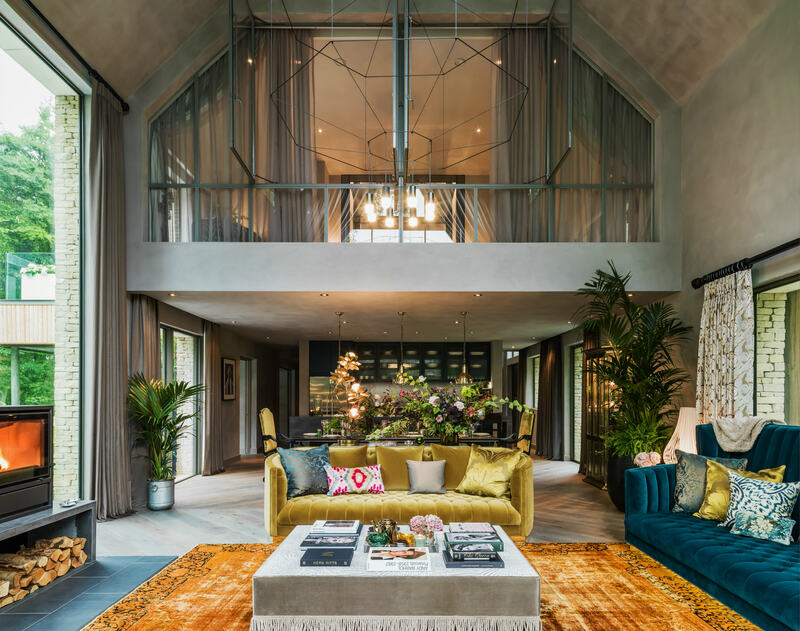 Either way, by combining relaxed, Cotswold country living and urban comforts, the Barnhouse - and its Kate Moss-designed interiors - offers all its visitors a secluded, luxurious hideaway. Sophie Killip was a guest of THIRDHOME & The Lakes By Yoo. For more information on this partnership please visit www.yooclub.co. Additional information on THIRDHOME’s Exchange, Rental and Adventures services can be found at www.thirdhome.com.